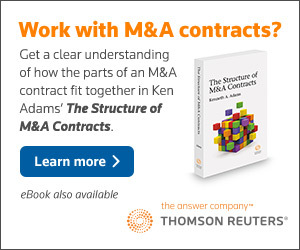 Ken Adams gives public and in-house seminars on contract drafting, as well as webcasts. 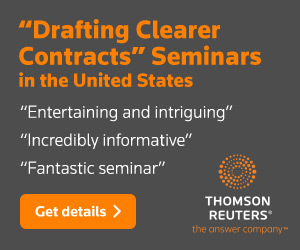 In his seminars, Ken reviews issues he addresses in his writings, focusing on those areas where the standard drafting usages are most at odds with clear and effective drafting. Rather than simply lecturing, he uses discussion and drafting exercises to encourage participation. Breadth. Rather than offering a grab-bag of insights and war stories on a narrow range of issues, Ken systematically addresses a range of topics in his seminars. Rigor. Instead of accepting the conventional wisdom regarding drafting usages, Ken instead researches thoroughly the contract context, the related caselaw, and all relevant principles of general English usage before reaching his often innovative conclusions. Experience. Ken has practiced as a corporate lawyer at major law firms and has many years of experience in drafting contracts. Furthermore, his extensive writings, his experience in teaching at a major law school and giving dozens of seminars worldwide, and his work as a consultant to corporations give him a unique perspective and understanding. Depth. Ken’s seminars aren’t an end unto themselves. Instead, they offer participants an introduction to continued learning, in that his seminars are backed up by his groundbreaking books.